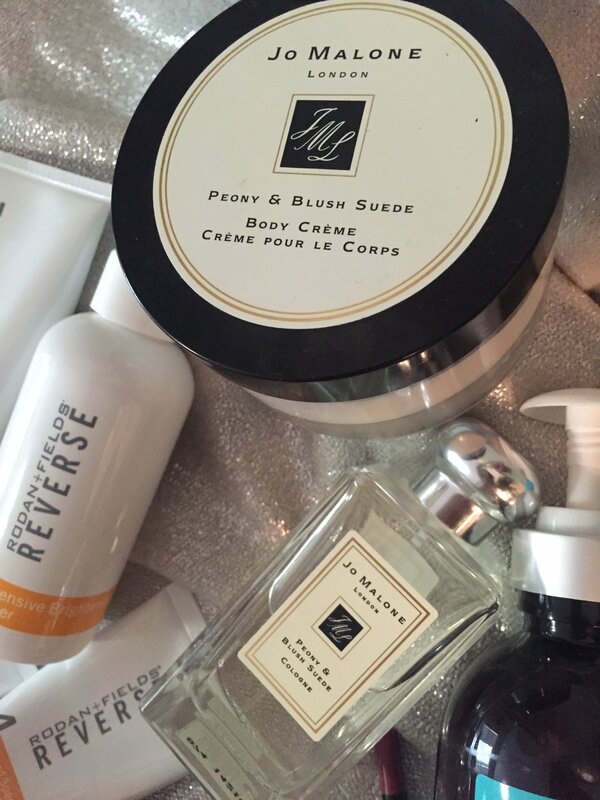 Now that summer is in full force, I wanted to take some time to share some of my favorite beauty items that help me deal with this crazy summer weather here in Kansas City. I don’t wear a lot of makeup, so having the perfect facial regimen is important to give me that healthy looking glow so I don’t have to wear anything but a little bronzer and lipstick/gloss. It’s also important to have healthy hair with lots of volume and last but not least, I love having moisturized skin with a fantastic scent! 1. 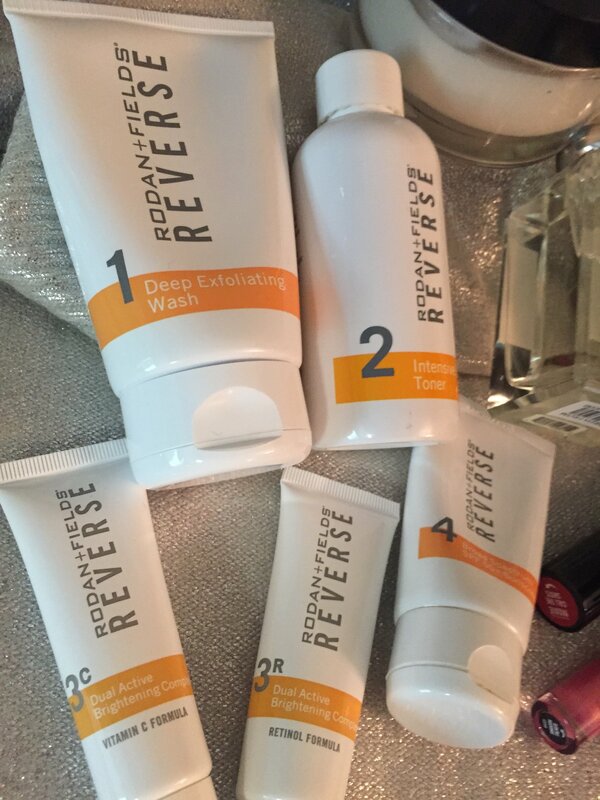 Facial Regimen It’s what everyone notices first and we ALL want to put our best face forward. You may remember my post on Summer Ready Skin with Roden + Fields. I have now been using it for awhile and I LOVE it. It is part of my daily routine and I can really see a difference in the even tone and most importantly the brightness. What I love about it is the exfoliating wash. Don’t get me wrong, I do love me Clarisonic and have been using it for years, but there’s something about using the exfoliation with your fingers to really get into all the nooks and crannies of your face. Then you follow that with the next steps: toner, Vitamin C & Retinol creams and finaly a sunscreen or evening moisturizer. 2. 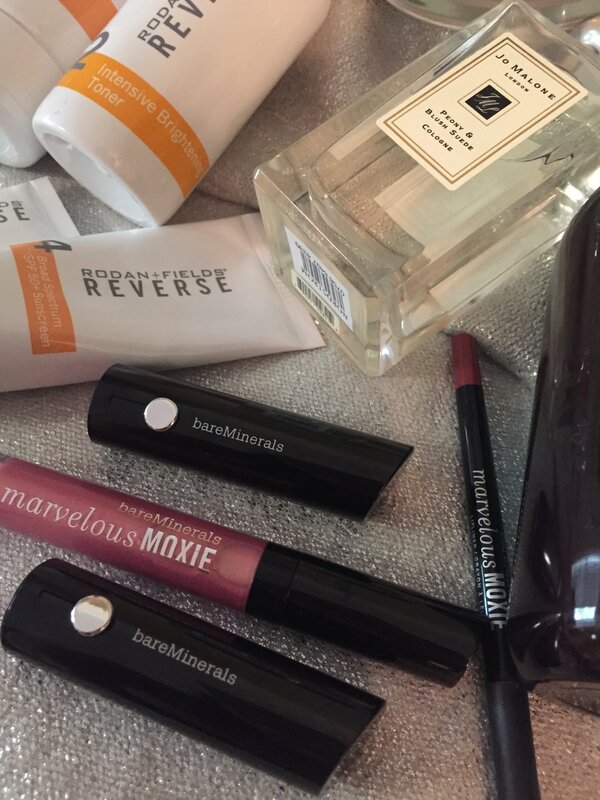 Lip Sticks & Gloss Have any of you tried bareMinerals? I have to say at first I didn’t think it really mattered what I used as long as I liked the color. Boy was I wrong! My sister has been using it for a while and she got our mom into it and now I’m starting to get into. I have started with the lipsticks and gloss. I LOVE THEM and look for any excuse to wear them now! The lipstick stays on for hours, it is almost like a stain so you don’t have to re-apply ALL the time (although I do sometimes just because I love it, HaHa). The gloss is also fabulous, it’s not sticky and it’s infused with a touch of mint so it gives your lips a little tingly, fresh feeling! 3. Hair Care This time of year is exceptionally hard to tame the mane with the humidity we get here. Frizzy, flat hair is just not my thing! 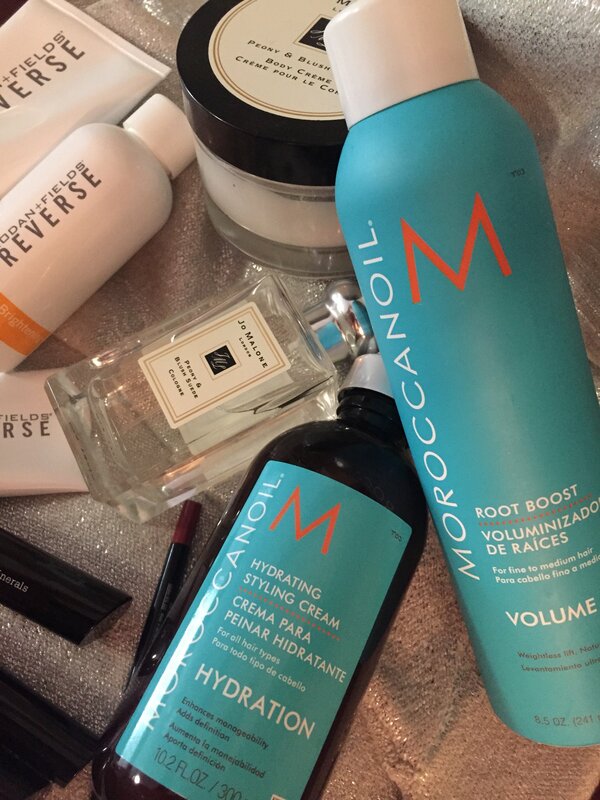 That’s why I can’t get enough of MoroccanOil’s Hydrating cream and I’m totally obsessed with the Root Boost for amazing volume. Using the Hydrating cream works great whether you put it on damp or dry hair. It gives your hair a silky shine and really makes it look healthy and hydrated. I have used the Root Boost both ways and will say that it definitively works best on damp hair then blowing drying your roots with your head flipped over (this helps the roots dry straight-up allowing for it to give the body). 4. Scents and Body Moisturizer I must say, I pretty much love all things Jo Malone. The scents are so fresh and light, I actually like several of them (I keep a ton of different samples in in the house, purse and care for when I want to mix it up or need a fresh spritz), but my absolute fave right now is Peony & Blush Suede. It is so light and summery; I JUST CAN”T GET ENOUGH! 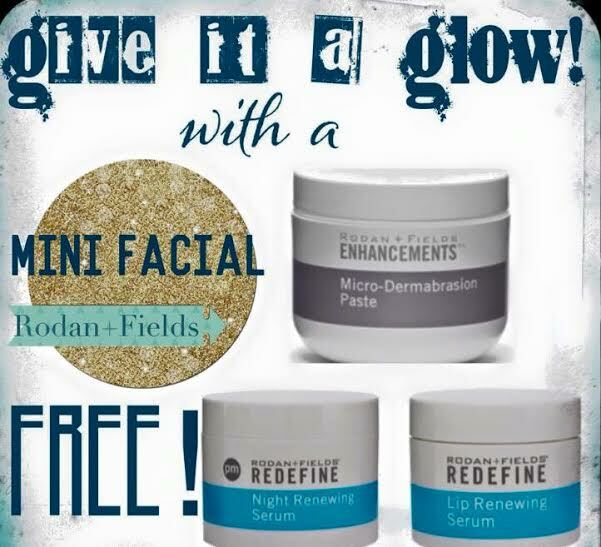 Now for the BEST part of this post, I have teamed up with my friend Hillary, my RF consultant, to give away 3 mini-facials from Roden + Fields. Each winner will receive a sample of the Micro-Dermabrasion Paste, Redefine Night Renewing Serum, and Redefine Lip Renewing Serum. The giveaway will run for one week and 3 lucky readers will be chosen at the end of the week. Click the Link Below and enter your email address to enter. You may start following me on Instagram or leave a comment on the Original IG post for an extra entry. Gook Luck Beauties !